Tirana Half Marathon returns on October 15th 2017 on its second edition. This Marathon has already begun to create a sport tradition in our city and also this year will start with Fun Run category. There will be hundreds of pupils from Tirana schools who will run with one purpose: To educate generations through sport. We are trying to motivate the younger generations for an active life, in this way the Marathon will have its future athletes. It has the same importance for us the Wee too category where we want to include people with different abilities. The aim of this category is to bring motivation rather than competition. 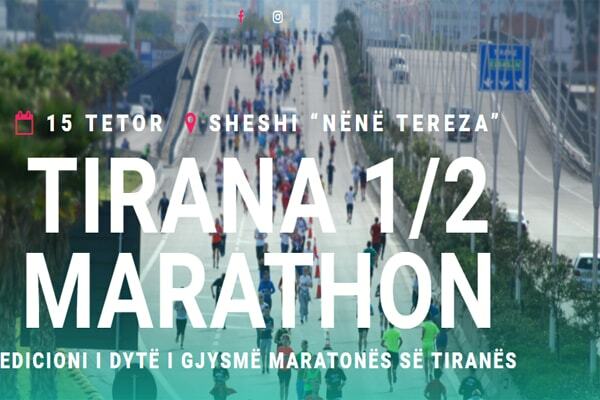 As a true Marathon requires there are also two categories: Half Marathon (21.975 km) and Tirana 10K, where we invite to participate all Albanian and foreign citizens over the age of 18. After the last year’s success, Tirana Half Marathon has been certified its new itinerary by the International Marathon and Distance Race and has become part of the World Athletics International Athletics Federations. The new itinerary will cross through the most attractive points of the city making this race not only a competition but also entertainment. The active generation for us means an active society; an active society means a happy city. We welcome you to join us. Meeting place: Mother Teresa Square Register here!